Almost one year ago, Summer Carmack, Kirk Jackson, and Jocelyn Howard joined second year resident Perry Haas as the 2014-15 Long Term Residents at the Red Lodge Clay Center. It has been an exciting and productive year at the Fox Studios and the Resident Exhibition 2015 presents the culmination of their hard work and research into their studio practice. Each resident has a unique and individual approach to the ceramic medium. We are proud to showcase their artworks in the Loft Gallery exhibition this month. Using porcelain as her chosen clay, Summer Carmack uses a subtle pastel color palette to compliment her soft porcelain functional wares. Sometimes using two colors on one piece, they blend together creating a smooth transition into one another. In contrast to her forms, she carefully disrupts the surface with sharp, incised lines giving emphasis to specific areas of the surface. The handles on her mugs and teapots continue her soft and smooth forms and feel quite comfortable for daily use. Perry Haas has a passion and love for the wood kiln and the process involved with firing his artwork in an atmospheric environment. Using nature and historical pottery as his influences for his forms, he creates common pottery forms that reference his interests in the antiquity. 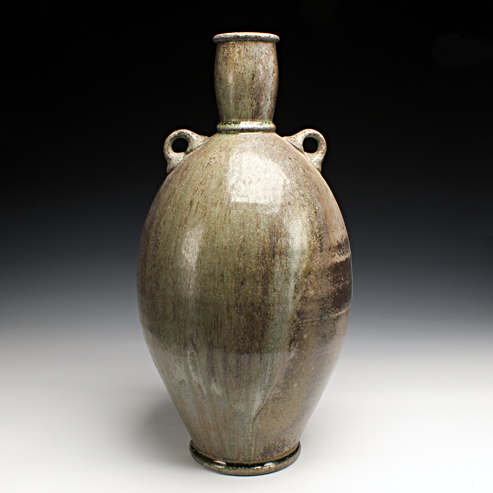 Perry choses to use minimal glaze and allow the wood kiln to leave marks on the artwork. Thinking about placement of each piece within the kiln, he embraces the unpredictability of the flame and how it will translate to the surface of his artwork. The figurative artwork of Jocelyn Howard revolves around narratives that incorporate gender, identity, sexuality, and aspects of adulthood that examine both playfulness and different emotional states within the human psyche. Her figures are constructed with a precise attention to detail that encompasses the entire surface with multiple layers. In regards to sexuality, Jocelyn uses a covert tone rather than punching the viewer in the face with an overt, one-liner. Experimenting with various slips, Kirk Jackson is interested in how these materials can affect the surface from atmospheric kilns, both in the soda and wood kiln. He wants the flame to not only leave a mark on the surface of the pottery, but to also interact with the materials to leave an imprint. With the addition of grog to the clay, the surfaces become bumpy and textured enhancing the outside of the pottery and contrasting to the smooth interiors. Daily use and the ritual act of using functional ceramics are important factors for Kirk during the making stage. Obsessing with details during the beginning making stage and then letting go and allowing the kiln to take control are what drive Kirk to create.